When news broke earlier this morning that Ryan Gosling could be starring in the new Star Wars movie, we almost didn't know what to do with ourselves. Who would he play? Will his smugness get in the way of his lightsaber wielding? 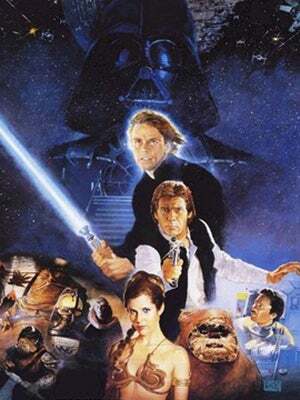 (Though, there may be no character in all of filmic history who more successfully defines "smug" like Han Solo...). But most importantly...wasn't he retiring? So, we dug around because this rumor was just too good to be true. And, our gut feeling was right. According to the Latino Review, Gosling was reportedly vying to play Luke Skywalker's son in Disney's Star Wars: Episode VII; a claim that his reps have since come out and denied: "This is not true." The earlier report also mentioned that Zac Efron could be playing Han Solo's son. Word on the validity of that statement is still up in the air. An official announcement isn't expected until sometime in August during Disney's D23 Expo. It's rumored that Star Wars was kept out of Comic-Con this year specifically for one reason: to drive hype.